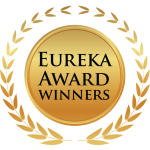 The Eureka Award recognizes and honors those who “have made significant contributions and demonstrated an abiding dedication to establishing and sustaining Collaborative Practice in California.” Every year, CPCal, the body overseeing Collaborative Practice for the State of California, grants this award to only 2-5 attorneys, financial specialists and/or mental health professionals. 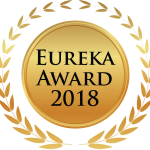 Our colleague and leader of Pasadena Collaborative Divorce, Ria Severance, LMFT, was honored with the Eureka Award by Collaborative Practice California at our 2018 state conference for her abiding dedication and significant contributions to Collaborative Practice. Congratulations Ria! 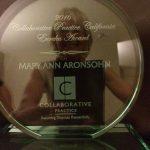 Our colleague and leader of Pasadena Collaborative Divorce, Mary Ann Aronsohn, LMFT, was honored with the Eureka Award by Collaborative Practice California at our 2016 state conference for her abiding dedication and significant contributions to Collaborative Practice. 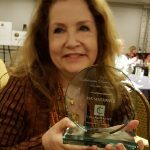 Congratulations Mary Ann!